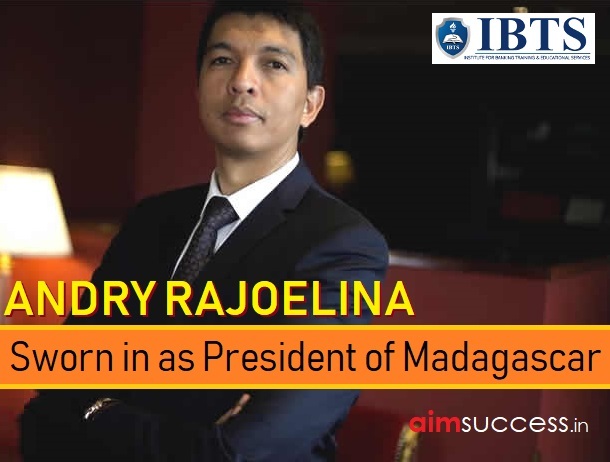 Andry Rajoelina has been sworn in as President of Madagascar at the capital city of Antananarivo. High Constitutional Court had declared him as the winner with 55.66% of the votes. The oath-taking ceremony was attended by a delegation from 35 countries and international organizations. It is the first time in the history of the country since its independence that a democratic power transfer and a peaceful power transition took place between two elected Presidents. Renowned Lingayat seer Shivakumar Swami (111-year) popularly known as 'walking God'’ passes away due to age-related complications at Tumakuru, Karnataka. Shivakumar Swami supervised the growth of Siddaganga by expanding the number of educational institutions of the Mutt from 4 (in 1940) to over 70 at present in Karnataka. Shivakumara Swami was born on 1st April 1907 in Veerapura village of Ramanagara, Karnataka. The largest defence exercise coordinated by Indian Navy, 'Sea Vigil' has begun in entire 7516.6 km coastline and exclusive economic zone (EEZ) of India. It will involve all 13 coastal states and union territories along with maritime stakeholders including fishing and coastal community. It's a build-up towards the major theatre-level tri-service exercise TROPEX conducted by the Navy. Sea Vigil and TROPEX together will cover the entire spectrum of maritime security including the transition from peace to conflict. This exercise is being facilitated by the ministry of defence, home affairs, shipping, petroleum and natural gas, fisheries, customs, state governments and other agencies of the Center and the state. The Odisha Government has announced a hike of Rs 200 per month in the social security pension under Madhu Babu Pension Yojana (MBPY). It will come into effect from 15th February 2019. The Madhu Babu Pension Yojana (MBPY) is a pension scheme under the Department of Social Security and Empowerment of Persons with Disabilities for the disabled, old age persons in the state of Odisha. The Scheme was instituted by merging the two pension schemes i.e. namely, Revised Old Age Pension Rules, 1989 and Disability Pension Rules, 1985. India Steel 2019 Exhibition and Conference has begun in Mumbai. The event provided an opportunity for all the stakeholders to deliberate and identify ways to contribute toward building a robust roadmap for the further growth of the steel sector. Around 10 thousand business visitors both from India and abroad are expected to visit. The three-day event organised by the Ministry of Steel will help chart out the future growth path of the steel industry. According to The International Monetary Fund (IMF) report, India will grow at 7.5% this year and 7.7% in 2020. It’s an impressive over one percentage point ahead of China's estimated growth of 6.2% in these two years. The IMF attributed the pick up to lower oil prices and a slower pace of monetary tightening. Earlier, Price water house Cooper's Global Economy Watch said that India is likely to surpass the United Kingdom in the world's largest economy rankings this year. The Reserve Bank of India (RBI) has approved the appointment of V Vaidyanathan as Managing Director (MD) and Chief Executive Officer (CEO) of IDFC First Bank for three years period. In December 2018, IDFC Bank and non-banking financial company Capital First completed their merger, creating a combined loan asset book of Rs 1.03 lakh crore for the merged entity IDFC First Bank. According to Nepal’s central bank circular, Indian currency of Rs. 200, Rs.500 and Rs. 2,000 denominations cannot be carried and used for trading. Under the new regulation, Nepali citizens cannot carry these denominations to countries other than India. Indian notes of Rs 100 or below, are allowed for trading and conversion. It could affect Indian tourists visiting the Himalayan nation where Indian currency is widely used. The Indian government introduced new banknotes of Rs 2,000, Rs 500 and Rs 200 denominations after the demonetisation of old notes worth Rs 500 and 1,000 in 2016. US Based Indian poet Ranjani Murali has been awarded the “Woman’s Voice Award” at the Apeejay Kolkata Literary Festival (AKLF). The Objective of the award is to recognize and encourage creative writing by women in India. The Award carried a cash prize of Rs 1 Lakh along with a citation. Ranjani’s first book “Blind Screens” was published in July 2017. Her second book “Clearly you are ESL” won the Great Indian Poetry Collectives (GIPCs) Editor’s Choice award. Himachal Pradesh BJP, Member of Parliament (MP) Lok Sabha ‘Anurag Thakur’ has been bestowed with Sansad Ratna Award for his distinguished performance as a parliamentarian under Jury Committee Special Award category. He has become the first BJP MP to receive the Jury Committee award. 12 parliamentarians were honoured with the Sansad Ratna award. In 2010, the Sansad Ratna Awards were set up after a suggestion from former President Dr A P J Abdul Kalam. The idea was to honour parliamentarians who perform. The International Cricket Council (ICC) has announced the men’s Test and ODI teams of the year. Virat Kohli (30-years) has become the first player to win the Sir Garfield Sobers Trophy for ICC Cricketer of the Year, as well as the ICC Men's Test Player of the Year and the ICC ODI Player of the Year awards. Kohli has also been named the captain of ICC's Test and ODI teams of 2018 for a fabulous run in international cricket. Kohli scored 1,322 runs (average: 55.08) in 13 Tests with five hundred during the calendar year while in 14 ODIs he amassed 1202 runs (average:133.55) with six centuries. In the last calendar year, skipper Kohli scored more than 2,500 runs in both formats of the game combined with 11 centuries. Today, Indonesia Masters badminton tournament has begun in Jakarta, Indonesia. Olympic silver medalist PV Sindhu, Saina Nehwal, and Kidambi Srikanth will look to continue their impressive run when they start their campaign at the tournament. Sindhu will begin her campaign against former Olympic gold medallist China's Li Xuerui. Srikanth (8th-seeded) will be joined by other Indians such as Sameer Verma, B Sai Praneeth and HS Prannoy. The 2019 Indonesia Masters (DAIHATSU Indonesia Masters 2019) is a badminton tournament that will take place at the Istora Gelora Bung Karno in Indonesia from 22 to 27 January 2019. This tournament is organized by the Badminton Association of Indonesia with sanction from the BWF. It has a total purse of USD 350,000.